While I was away experiencing Glass Craft Expo in Las Vegas, The San Antonio Calligrapher’s Guild (SACG) annual Spring Exhibit opened. This year three pieces were successfully delivered; Love the piece which I had intended to hang last year without success, a small series inspired by Jackson Pollock, and a piece which started as part of my participation in the 2007 Blog Action Day. This piece was an experiment from beginning to end. 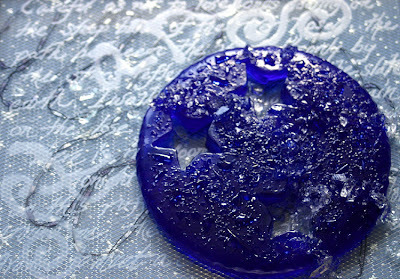 Starting with recycled glass from shattered wine bottles I cast the material in six inch rounds. One of those bottles was from a German Riesling. It had a lovely color which reminded me of the night sky. 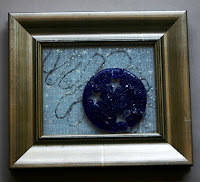 To this piece I added three stars. When the piece came out of the kiln I did some primary cold work and set it aside. Months later I picked it back up, although still unsure what I wanted the end result to be I knew it should be rough. It called for texture, so I gave it some carving up the edges and adding raised shards of the glass to the surface. At the same time I began searching, wondering and researching the original wine bottle. I found the contents it once held came from the German wine region along the Mosel River, a winding river known for its sharp banks lined by vineyards. I began to write the story of a late night walk along these banks on a clear sheet of glass. The text and the hand it was written in were crude, appropriately mirroring the rough starry night I would soon mount covering much of the text in the process. On top of this sheet of glass I loosely dripped etching cream to spell out the word Stars. With this the first layer was complete. Behind this sheet of glass came a silver ribbon winding it’s way diagonally from top to bottom. The Mosel River had made its’ presence. Then a sheet of wire mesh, the vines, followed by a second pain of glass with text made almost invisible by the things in front. Finally a sheet of paper filled with stars. The piece was constructed, torn down and rebuilt several times before this multi media presentation of glass, fiber, metal and paper was finally framed. Satisfied with the experience this experiment afforded, I look forward to continuing to develop the ideas which it generated. Lovely work! I agree the blue glass from the wine bottle is amazing. Wonderful what you did with the blue glass. I also enjoyed your story of how this piece unfolded. This is wonderful! Great reuse of glass. Your work is so very beautiful, and it really fascinates me to read your process. This is a very special piece - the color is amazing! I love that blue and the rough texture of the glass. Fabulous work. It has been several years since I've shared my creative life on this blog. To long really. So if only for myself, I have returned. To record my creative journey. Thanks for joining me for a bit of the adventure. © 2006-2018 Nicole Vachier Lozano. Powered by Blogger.